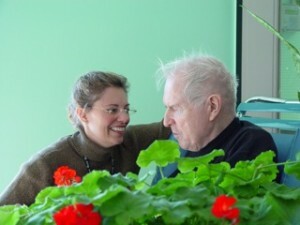 I was fortunate enough to walk through a journey of Alzheimer’s by my father-in-law’s side. Together we mastered the mysteries, the fears and the utter atrocity that the disease brings and we also discovered a deep rooted love and admiration for each other. My father-in-law, Poppa as he was known by family, was 65 when he forgot to attend the birthday party we were hosting for him. That is how the disease first introduced itself. As a family we all took on different roles. Some did his finances, others his legal counsel and I did the visiting. Being the extended member of the family, Poppa’s finances and legalities were not my business nor my strength. People and patience were and so began my adventure with Poppa and my role as a caregiver and battler of Alzheimer’s. I had never met the disease before, yet in today’s world technology gives us a library of information right in our own laptop. So I read, researched and spoke to anyone who would take a call. I learned quite quickly that Alzheimer’s would bring with it demons for Poppa that I would never be able to see or reason with. In order for Poppa to deal with those black thoughts I had to ensure that with every visit I arrived in a positive and open to anything kinda mood. There were good days and there were bad days. The good days are when he recognized me or knew me as someone kind. The bad days are when he was frightened, didn’t know where he was and just wanted to die. The worst day was when he realized that the Alzheimer’s disease was taking him and making him act crazy. You can not argue with dementia or Alzheimer’s. You can’t make anyone with those diseases remember thoughts, places or things. Instead you just follow their lead and regardless of who they think you are at any given moment they know, somehow, that you are there for them. As a caregiver, I developed a level of survival techniques second to none. I learned to expect the unexpected, to do the bizarre as if it was routine and to create a story for almost every daily routine. I never argued. I never corrected. I simply bended. Flexibility, in the role of caregiver, can be your greatest strength. If Poppa wanted to go for a run by himself I encouraged it by running behind him. He would often stop to catch his breath and then wave to me as a stranger. If Poppa wanted his clothes dry cleaned I washed them in a laundromat and then hung them on dry cleaner hangers and if Poppa wanted to tip the nursing home staff we gave him Canadian Tire money to do just that. He wanted work to do so I brought him stacks of paper to file through and staple together. When getting dressed became confusing we put his daily clothes complete with socks, underwear, belts and matching tops and bottoms in bags that said Monday, Tuesday, Wednesday, etc. so that he knew what to wear. I learned to listen to Poppa’s constant chatter because throughout the never ending sentences there was always something he was trying to tell me. He talked about the people who visited him at night, the drug pushers, and the ones who beat him with the lights turned off. As it turns out my father in law, a life long flirt and lover of women had reached a stage in the disease where he did not like to be touched. By attending a staff meeting with Poppa charges we all agreed to modify the way that staff approached Poppa and we were able to reduce Poppa’s agitation, the number of temper tantrums and arguments that the staff experienced while getting Poppa to take his medication at night. As you experience your own adventure as a caregiver, I invite you and encourage you to reach out to others who have gone down the very same path. There is strength in numbers and while you may not find that strength in your own family you can find it with other caregivers and within this site. Explore, research and enjoy the moments when the one you are taking care of smiles a tiny smile or naps without nightmares because you were there to care.